The following interview was prepared by Pencils for Africa’s Deputy Editor, Athena, and was then conducted by the entire Northern California-based editorial team via Skype with Professor Saki Mafundikwa in Harare, Zimbabwe. Professor Mafundikwa is Founder and Director of Ziva, the first Graphic Design and New Media school in Harare. He has advanced degrees from Yale University. This interview below was conducted on Wednesday, February 13, 2013, at 12 noon California time (for the Pencils for Africa editorial team) and 10pm Zimbabwe time (for Professor Saki Mafundikwa). “Thank you so much for staying up so late”. “Thank you, good to hear from you guys”. (Questions below from the editorial team are in red ochre color and answers are in regular grey type). Your book is beautiful, do you think that the historical Alphabets and writing systems you showed in your book influenced the writing system in Africa today? I always tell my students that we are in the business of creating beauty. Creating beauty – it is paramount to everything they do. There is no writing system that can be characterized as African in Africa today, it has been swallowed up by Arabic or Roman to a lesser extent, and that has created a bigger problem. When they talk about design in Africa, we mean in the Roman Alphabet, and if it is not in Roman Alphabet it is not ‘Graphic Design’. That is one of the reasons that I started the book and also started a designing school. To help young people to broaden their mind and to put a bigger value and significance to their own heritage. I like how you say that all people – even in the United States – have symbols that they associate with, and that in the United States we have a social security number which associates us as individuals. You said that these symbols are replacing the writing systems in a digital world. I see the day when we do not have to carry any money, credit cards, ID cards, including passports, divers licenses, etc. Those cards make our wallets so bulky. Today as you enter the United States from above, say SFO, or JFK, or LAX, they scan your eyes and fingers. This information is stored in a databank by the government, so if you commit a crime, or say, you die, it is very easy for them to get your identity. Well, someday soon, I am sure, we will all have a barcode engraved somewhere in our bodies that will contain every bit of information about us. How much money we have in the bank, social security number, drivers license, etc. Everything. In the Bible it is referred to as ‘the mark of the beast’. Far-fetched maybe, some twenty years ago, but today, it is a real possibility. We were very interested in the chapter on the Rock Art of the San People. The wall paintings that represented the communities thousands of years ago were really interesting – similar to the wall paintings that are in the southwestern United States from the native American Indians. Those rock paintings are very special. They show us that humanity has always had the urge to leave some form of record. I would say that the sand cave drawings are my favorite. Mr. Ajania also explained that you and he met for the first time here in the San Francisco Bay Area having been introduced by an MIT professor. He explained further that in your first meeting you discussed The Great Zimbabwe at Mazvingo, which is one of the great wonders of the world. Subsequently, Mr. Ajania visited The Great Zimbabwe and your students at Ziva helped to film and document this event. Mr. Mafundikwa, why is The Great Zimbabwe significant for you as a Zimbabwean? We both meet at a mall in San Francisco. We went to a very nice Indian restaurant and he used his fingers just like we do here in Zimbabwe, and I love that very much. I liked his easy going manner and we became fast friends. At the Great Zimbabwe, I have a ritual, I take every visiter to Zimbabwe there. It is a place of intense beauty and is filled with such mystery, that I don’t think I will ever tire of visiting it. It is also an amazing architectural wonder, just like the pyramids in Egypt. Did some of these master engineers migrate as far south as Zimbabwe? This is a question that is will someday be answered, especially with advancements in science that are made everyday. I read in your book that you are a graphic designer and design educator with a special interest in typography. My mom has been working in graphic design for 25 years, so I grew up with her influence. What do you enjoy most about graphics? Without any doubt, I would say type. You see as a kid, I always doodled, and my doodles were always letter forms. I didn’t know that letters I saw in books were printed by printing presses, I thought they were hand-drawn. I set myself the goal of perfecting my letter drawing as the ones I saw in books. So I developed a love of typography from a young age. It is only when I came to the US in 1980 did I realized that what I had been doing all along was called ‘graphic design’. Because of your interest have you designed an Alphabet system? I started about 9 years ago, and then life got in the way. I will return to it one day and complete it. Why did you decide to research the ancient Alphabets of Africa? Do you think the writing systems will continue to change as society and the environments change? I grew up in the yolk of Colonization, and everything we were taught about Africa was negative. They even created Tarzan to sell the idea of stupid, clueless Africans. Somehow, deep inside, I never bought into that myth. 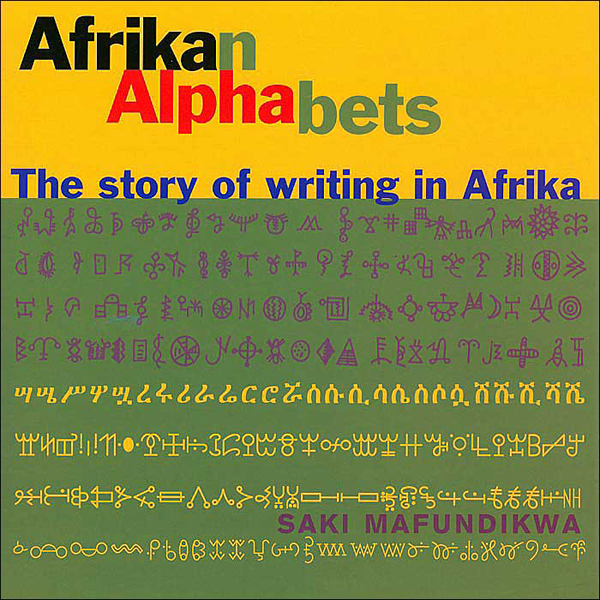 When I heard that Africans had devised writing systems it was like a eureka moment, it changed everything. I threw myself into the research vigor and passion, I was completely consumed. This was the embodiment of all the doodling I did as a kid. Everything coming to full circle, but in the most unexpected way. Yes, indeed, a really good feeling! Just wonderful! Everything has to evolve. Why did you decide to start Ziva? What are you hopes for the students that attend there? Ziva is a dream of mine from way back when. My father was a teacher, then a school master, and finally a school inspector, so I grew up around education. I have a very special relationship with my father! He turned 88 on the 3rd of February. I always knew I was going to walk in his footsteps, and being a perfectionist, and I got that from him, I always had the feeling I could run things in the best manor possible, so after years spent studying in the US, I felt I had learned a lot, and the only way of passing that on was through a school, my own school. I want my students to not only be the best designers they can be, but the best human beings they can be. Education is meaningless if it is for selfish reasons. Of course it is good to achieve the highest academic levels, but we can use that to better people’s life as well. We are the editorial team for Pencils for Africa, what is the most important message you would like us to take away from your book? I believe that to read and write is empowering in an incredible way. It is like giving vision to someone who is blind. That is the most important message about the work you are doing with Pencils for Africa. One of the aspirations of Pencils for Africa is to better understand the circumstances in which other people live. This is especially true for us here in America attempting to understand the circumstances of children in Africa – what their living conditions are, what their hopes are. The used pencil is a metaphor and a vehicle to gain this understanding and awareness. For example, we are learning that in some of the communities where we have just sent used pencils (through one of the PFA Founders, Mr. Allan Schwarz, who recently visited our school and is now back in Africa), about 30 children are accustomed to sharing one pencil. We have also learned that some children in Africa cannot go to school because their parents cannot afford the price of a single pencil. Our Pencils for Africa Global Ambassador, Mr. Jackson Kaguri, was only able to attend school in Uganda because his dad broke one pencil in 5 pieces so that he and his 4 siblings could each arrive at school with a fifth of a pencil. Otherwise, they would have been turned away. So, it is important for us to have this awareness. Similarly, when you and Karim were working on The Brick Project (with girls our age from Arundel Girls’ School) you worked on a hunger relief initiative in Porta Farm, Zimbabwe to raise awareness of similar circumstances amongst children participating in the The Brick Project. a. What is your aspiration for the future of The Brick Project ? b. What is your aspiration for the future of Pencils for Africa? People in America have no idea how fortunate they are. There is so much waste there. People throw away food, good food. People consume way too much, much more than they need. My answer to the last two questions is really just one: I wish more people like you guys, get involved in these two initiatives. One school that I got involved in with the Brick Project was the Arundel Girls High School, in Harare. We took some of the Arundel School girls to Porta Farm and it was a life altering experience for them. For you guys a pencil is nothing – unless you are an artist who loves to draw. A pencil is the least important of the tools in your schoolbag. Yet you are now discovering that in Africa it is the reason someone your age does not go to school. It is my wish and hope that one day, you will get the opportunity to go to Africa and meet some of the young people whose lives you have helped to transform. Now that, I would love to see! How did you decide to be involved with a Graphics career? I started at a very young age. I started to draw before I was in kindergarden, I would draw on the my skin and on the ground so my parents bought me drawing supplies. During my primary school, I would draw the charts for science and the maps for class. I loved to letter on the boards, I had no idea that what I was doing was graphic design. I would also do the posters in the dorms when I went to school in the United States. When there was a party in the dorm, I would design the poster for it, then someone said to me, “Are you in the Graphic Design Department?”. It was the first time I had heard of Graphic Design, so I went to the department and the professor liked me and my story and gave me a chance for a semester. I started the class and have not looked back since. If you did not know that the letters you saw in a book were made by a printing press, would you view graphics differently then you do now? Now it is more like the education and the experiences, I understand the process, so yes, I know how it is done so it is less magical. I have more sympathy toward the students when they start school. I give all the students a chance – even if they don’t seem as strong at the beginning, some of them turn out to be the better student in the end. When kids in Africa or America read this book, what would you like them to learn from your book? Well I want them to take away from the book how beautiful the writing systems are, I just want them to appreciate that. This is something that was created from people in Africa, are you aware that Africa is the cradle of humanity? Everyone on the planet is connected through their African ancestry. Do any of the alphabets and writing systems overlap with each other, are they similar in design? What I have discovered in my work – and I study all writing systems in the world – is that they all contribute to each other in design. The differences are amongst us as individuals and as communities. Ms. Chyah Wietzman: Thank you so much for your time, Professor Mafundikwa, we so appreciate you staying up late for us! Professor Mafundikwa: You are so welcome, it was my pleasure.